SMC is introducing new series IZN10 ionisers to eliminate the build-up of static electricity in industrial applications. At only 16mm thick, the series IZN 10 units are claimed to be some of the most compact ionisers on the market. Despite the compact dimensions, the ionisers incorporate integral low-voltage power supplies. Available in two options, the ioniser can be selected with either a long- or short-range nozzle to suit different applications. The long-range, high-flow option uses compressed air to boost its ionised air performance, achieving an ionised air balance to +/-15V and making it suitable for static elimination or dust removal at distances of up to 500mm. Alternately, the short-range, energy-saving option achieves an ion balance of +/-10V, consuming less compressed air, so is useful for the rapid elimination of static when working with individual 'spot' applications. 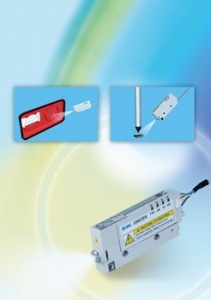 Key features of the series IZN 10 ionisers include an electrode needle indicator that provides an early warning of any reduction in the ioniser's performance, due to stains or wear to the needle, plus two energy-saving inputs that turn the ioniser off when either an air pressure drop is detected or when the static has been removed. Simple, fast and safe needle replacement or maintenance is also assured thanks to the IZN 10's needle cartridge type design. Available in a wide range of mounting options including both direct and bracket types, the series IZN 10 ionisers are fully compliant with relevant EU Directives.